Andy Thomas, choir director at Whiteaker Middle School, wants all kids to experience music. It’s why a couple years ago he started an Exploratory Wheel class for all sixth graders. It’s why he volunteers his time after school to teach guitar lessons. And why every summer he leads a week-long choir and drama camp for fourth through ninth graders that last year had over 220 kids. 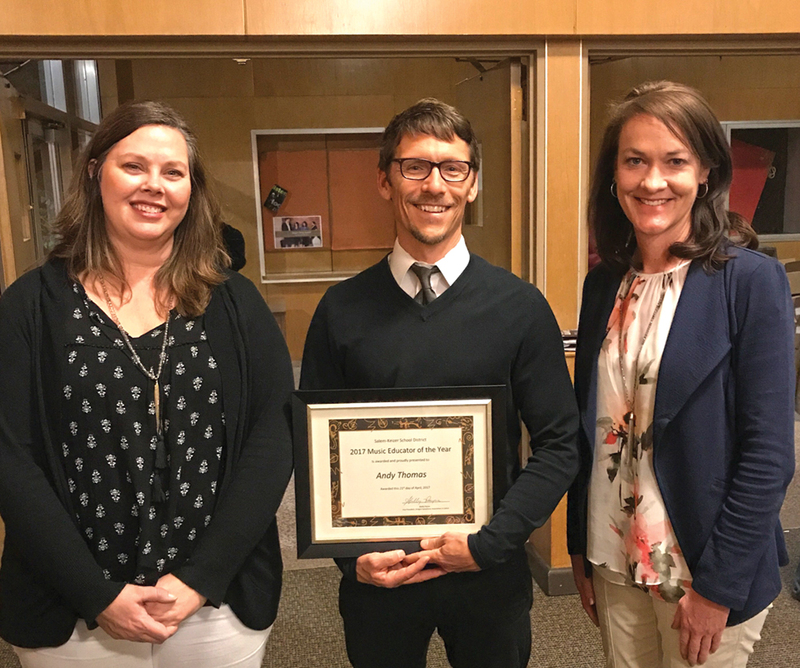 Thomas was recently honored for providing more opportunities to Whiteaker students and kids throughout Keizer with the Salem-Keizer Music Educator of the Year award. Thomas got his own education in music at McKay High School. Thomas is in his 12th year at Whiteaker, which already had a tradition of excellence, but he has grown the choir from 180-190 seats to over 280. The annual cabaret also existed as a dessert night but Thomas turned it into a bigger fundraiser event that draws an audience of more than a thousand. The guitar lessons came out of the summer camp and last year Whiteaker was able to purchase a full set of guitars. Thomas teaches two to three sessions a year of 20-25 kids each. “Where there’s a need, I go with it and kids were interested in guitar,” Thomas said. Thomas has also been able to travel, taking his advanced choirs on trips to Florida, Los Angles, San Francisco and Portland. Whiteaker was one of two middle schools invited to preform at the American Choral Directors Association Northwest Conference last March. “That’s a huge honor because they have one to two each year and to be selected is really difficult,” Thomas said. Whiteaker will preform at the Oregon Music Educators Association conference next year and Thomas hosted 22 choirs in Keizer for a choral adjudication festival this spring.